Google will showcase a picture drawn by an 11-year old Indian girl as its doodle on Children’s Day (November 14) in India. Sixth-grade student Anvita Telang won the National Doodle4Google competition, the company said today. Her drawing, titled, "If I could teach anyone anything, it would be" received over 100,000 votes over the past 10 days. Telang, a student at Vibgyor High School, Pune, illustrated greeneries, water, water life, balloons and other pleasantries in her picture with the message that people should try to enjoy every moment. 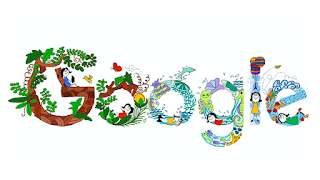 Google has been running competitions for its doodles (that special picture with a message you see above the homepage search bar) since 2009 in India. In a press statement, the company said with this program it aims to "celebrate and promote creativity, passion, and imagination in our younger users." Several other participants were also praised for their submissions. Some of their entries portrayed the significance of Indian classical dance, sign languages, gardening and books. Indian school kids routinely show an immense interest in Google’s competition. Google said kids from over 50 cities participated this year. "It’s heartening to see the messages that these young minds wish to communicate with such creativity. It was a tough competition," said Sapna Chadha, the head of marketing at Google India.